The DecArts podcast is back! I am excited to start the year off with an object. Hannah Winiker comes on to talk about bandboxes. 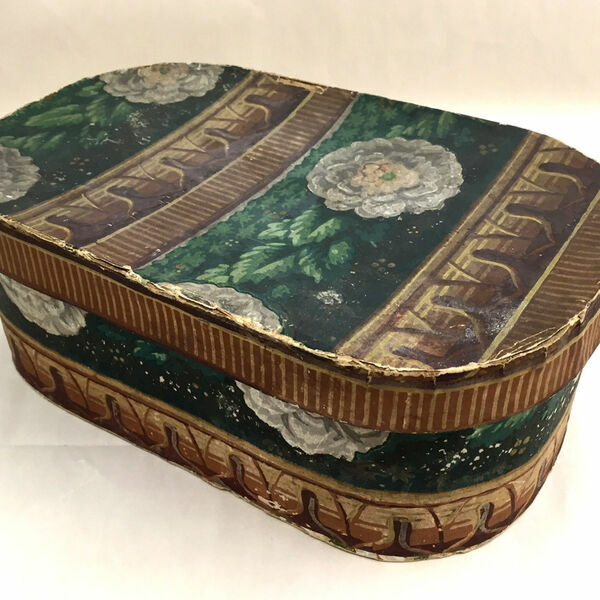 For anyone who isn’t familiar with bandboxes they are functional and decorative objects that held men’s collars and other fashion accessories. They represent a bridge between the handmade process of producing and the industrial process of manufacturing by machines that occurred in the 1800’s with the Industrial Revolution, which is around the time when the bandbox peaked in popularity,1820-1845. Physically, bandboxes are round or oval in shape and range in size and covered in wallpaper, or “paper hangings” as they were known then. Here are some of the links for the videos and articles discussed.